While shopping for groceries at Kroger April 9th, he decided to purchase ten Lotto Quick Picks. 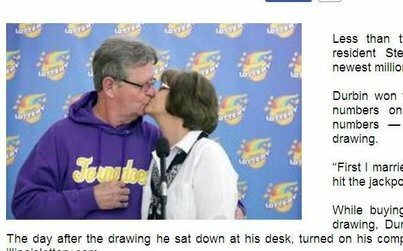 When he checked the results through the lottery website the day after the April 10 draw, he found that one of his tickets matched all the numbers drawn. The retired corrections officer chose a single payment of $11.6 million before taxes. He and his wife plans to spend a little, give out a little and save what remains. The Kroger store that sold the winning ticket earned a bonus equivalent to 1% of the prize amount – $202,500.